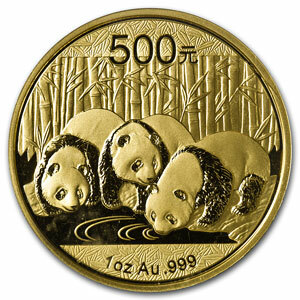 The Chinese Gold Panda is a gold bullion coin issued by the official mint of the People’s Republic of China. First introduced in 1982, the Gold Panda coin is minted in .999 pure gold. Over the past few years, the gold Panda has become increasingly popular with gold investors around the world. The obverse of the coin features a depiction of the Temple of Heaven with Chinese characters reading “People’s Republic of China.” The obverse features a portrait of a panda. The panda design changes every year, with the exception of 2001 and 2002, which share the same design. 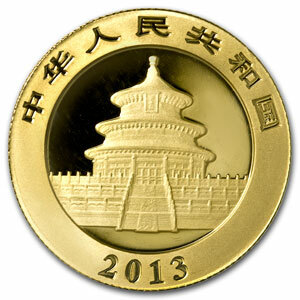 There is also a Silver Panda bullion coin series issued with the same yearly designs as the gold Panda coins. The ever-changing design, coupled with the cute imagery of a fuzzy panda, has made these some of the most collectible bullion coins in the world. The 1 troy ounce Gold Panda has a face value of 500 Yuan, and weighs 31.103 grams. It measures 32.05mm in diameter and is 2.70mm thick. Though the one-ounce size is the most popular, the gold Panda coin is also available in a number of additional sizes, depending on the year. Upon its 1982 introduction, the coin was available in 1, ½, ¼, and 1/10 troy ounce sizes. The 1/20 ounce size was added in 1983. As the smallest Gold Panda issued to date, it weighs 1.5552 grams, and measures 13.92mm in diameter and 0.83mm thick. Each coin carries an official face value, which has changed over time. Current face values range from 25 to 500 Yuan for sizes of one ounce or less. Larger Gold Pandas have also been issued, in 5 and 12 ounce sizes, making it economical to invest in larger quantities of physical gold. Although each coin has a specified face value and is considered legal tender, these gold bullion coins are not intended to be used in circulation. Their actual value far exceeds the face value due to the pure gold they contain. 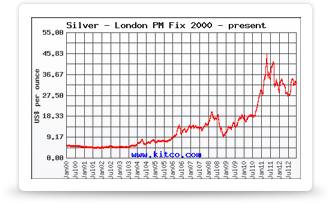 Each coin’s market value is based on the current spot price of gold, plus a per-coin premium. Chinese Gold Pandas typically command a higher premium than other gold bullion coins, owing to the popularity of the panda design. Certain years are considered rarer or more desirable than others, further driving up their numismatic value. These popular bullion coins are issued in prooflike brilliant uncirculated quality. Proof versions of the coin have also been released in many, though not all, years. The proof versions use a special minting process to produce a shiny, mirror-finish coin with a highly detailed image. These coins are highly valued by collectors, and typically command a higher price than their non-proof counterparts. There are several mints within China that produce these coins, though they are do not generally carry a mintmark, unlike U.S. coins. Each coin is individually sealed in a plastic holder before being released by the mint. The official distributor for Panda coins within China is the China Gold Coin Corporation (CGCC).